Vermont Brownie Company has been made famous for their Chèvre Brownies (goats cheese brownies). In a sauce pan melt 3/4 cup butter and chocolate together stirring constantly. When it is melted and smooth set aside. In a large mixing bowl beat 3 of your eggs, sugar and vanilla together. Mix in chocolate butter mixture. Fold in 1 cup of flour. Pour brownie batter into parchment paper lined 9x9 baking dish. In a small bowl beat cheese, honey, 1 remaining egg and 1 tbs of flour together. When it is smooth drop into 8 dollops across your brownie batter. 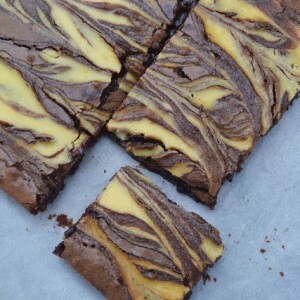 Run a butter knife through the cheese and brownie batter making a marble look. Bake for 30-35 minutes or until a knife inserted comes out with fudge bits.